Get the Full StorySpring is upon us, and flowers are in bloom - though, in the case of Southern California, they're in super bloom. 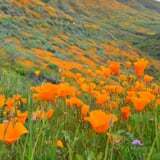 About once every decade, SoCal experiences what is known as a "super bloom," when the area's dreamy wildflowers wildly exceed its typical Spring blooms. The last super bloom occurred in 2017, but flower-lovers and Instagram users alike are in luck this year because - due to the right combination of rain, favorable temperatures, and lack of damaging winds - California was gifted two super blooms in just two years, and it's seriously a sight to see.